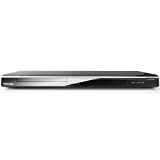 Amazon has the toshiba SD4300 progresive scan dvd player (black) for $75 with free shipping. Sells for $239+ Highest Price. Deals for $49 Lowest Price. Normally $113+. Image-Image Formats-JPEG:Interfaces/Ports-Component Video-Yes:Interfaces/Ports-Composite Video-Yes:Interfaces/Ports-Digital Audio Coaxial Out-Yes:Controls/Indicators-Remote Control-Yes:Physical Characteristics-Color-black:Physical Characteristics-Height-1.